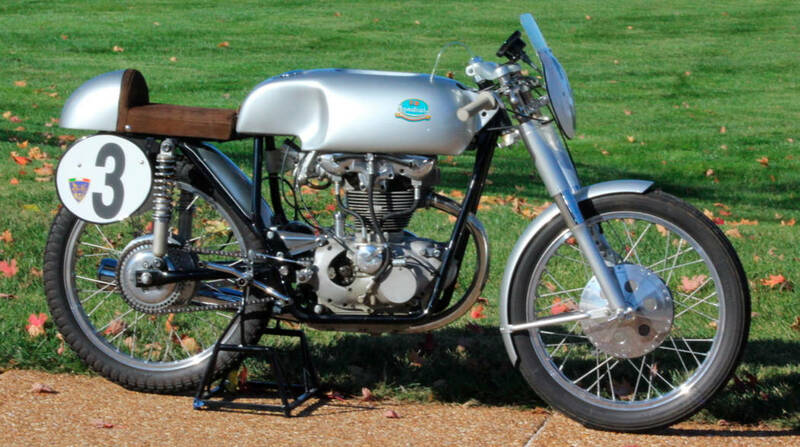 Mecum This 1956 Mondial F2 is an extremely rare example of a post-war racing motorcycle. It will be auctioned off at this weekend's Mecum Motorcycle Auction. Nearly 100 bikes from The Jim Lattin Collection will be among the auction’s featured attractions. The collection represents more than 100 years of two-wheelers from a turn-of-the-century De Dion-Bouton, a 1905 Iver Johnson and a 1916 Shaw Motor Bike to present-day examples from Ducati, Harley-Davidson, Honda, Yamaha and more. The Best of Show Collection comprises 21 no-reserve consignments, with nearly all restored by master motorcycle craftsmen, including Don Harrell, Martin Schalkwijk, Jim Hiddleston, Rod Wheeler, Lars Petersen, Dale Matteson and Jim Kilau — all noted to be among the best in the world in their respective fields of expertise. Among the Best of Show Collection are selections from BSA, Matchless, Norton and others, with Triumphs ruling the roost; the Bonneville T120s span from 1966 through 1969, and three of them carry the “R” racing designation. Other collections consigned to Mecum’s Las Vegas June motorcycle auction encompass bikes from the Estate of R.J. Casale, including motorcycles that were impeccably restored, like a 1960 Cushman Super Eagle, a 1953 Indian Chief and a 1965 Harley-Davidson FLH Electra Glide; the Tim Walker Collection, an assemblage that consists of Italian, French, English and American bikes; a dozen racing bikes from collector Bob Weaver; and 10 motorcycles from the John McNulty Collection, nine of which will be offered without reserves. Bidder registration for the auction is for $200 at the auction and includes admission for two to each auction day. General admission tickets are available for $30 at the door and online at Mecum.com. Children 12 years of age and younger receive complimentary admission. Doors open daily at 8 a.m., with the auction beginning at 10 a.m. Portions of the event will be broadcast on NBC Sports Network on Sunday from 1 to 7 p.m. A live stream of the entire auction will be presented at Mecum.com. Mecum’s website is updated daily with the latest consignments, including detailed descriptions and photographs of the motorcycles. To view the list, consign a motorcycle or register as a bidder, visit Mecum.com or call 262-275-5050 for more information.